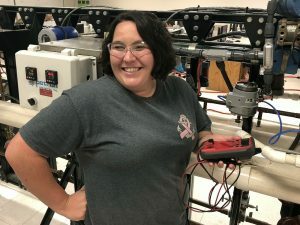 (WACO) — Education may be the key to creating a better life for oneself, but for Texas State Technical College student Taylor Dudik, it’s also the opportunity to create a better life for others. Dudik is a second-semester Instrumentation Technology student who plans to use her degree as a way to support her five-year-old daughter and stay involved in various philanthropic activities. Dudik finds time in her busy schedule to volunteer with the Heart of Texas Region MHMR Center in Waco, as well as fostering animals through Gray Mutts Rescue and Sanctuary in Clifton and running T&B Doggie Haven in Aquilla. Dudik’s life can be hectic at times, but she is determined to set an example for her daughter. Dudik’s giving attitude made an impression on her instructors and subsequently helped her get to know one of her neighbors. Martin and Dudik both encourage women to enter the instrumentation field and take advantage of the financial opportunities that can follow. “For a woman who is not afraid to get outdoors and get to work, you can provide for yourself. Especially for single mothers, it’s great because you can provide for your family and have insurance and be able to thrive on your own,” Martin said. Dudik was pleasantly surprised to have a female instructor and to see other women in her classes. She thoroughly supports anyone who has an interest in the field. Dudik plans to graduate in spring 2019 with an Associate of Applied Science degree. This entry was posted in Waco on July 4, 2018 by Daniel Perry.